Keep Watching These Pages For A MAJOR Announcement! Boy, what a time we had!!! The Buckinghams ... The Cryan' Shames ... The New Colony Six ... The Ides Of March ... The Shadows Of Knight ... in the mid-to-late '60's, ALL of these Chicago groups put The Windy City on the map with their totally addictive, contemporary pop sounds. you are NOT going to want to miss this VERY special one-time event! On May 7th a literal "Who's Who" of Chicagoland Pop Artists will unite on stage for a very important fund-raising event on behalf of one-time Buckinghams keyboardist Marty Grebb, recently diagnosed with cancer. Ron Onesti has donated the stage of his Arcada Theatre to house this very special event ... and performing together for the first time in 40+ years you'll find current and one-time members of The Buckinghams (Carl Giammarese, Nick Fortuna, Dennis Tufano and Marty Grebb), along with Marty's daughter Anna, who I'm told has an INCREDIBLE voice, original founding member and Drummer of CTA / Chicago, Danny Seraphine as well The Chicago Experience Band and Horns. If you grew up loving this music, you are NOT going to want to miss this one!!! CHICAGO MUSIC - 60’S STYLE! On Stage together for the first time in 45 years! and bid on some of this one-of-a-kind merchandise! Haven't done one of these in a while!!! Here's what I could pull together quickly this morning before I had to run out the door! Thanks a million for posting Elvis' tune BLACK STAR, later on to become FLAMING STAR. Your posting of it is the second time I have ever heard it, the first time being when the man with all the individual Elvis tunes came to visit our local oldies stations periodically during the 1990's on Elvis' birthday. I do have the song FLAMING STAR on that RCA Camden label album which you did mention. The man who visited our local oldies station with all the Elvis tunes did bring in various suitcases, briefcases, etc. with supposedly every Elvis tune available at that time. He drove a station wagon as I recall. Also during this same time, there was a DJ in Tulsa, Ok, on station KAKC 970 AM, who did an oldies show on Saturday mornings called OKLAHOMA BANDSTAND. John Henry was the DJ's name and he was on for six hours, from 6 am - 12 noon. On the weekend closest to Elvis' birthday, he did the same thing in that if anyone called in and requested an Elvis song that he did not have in the control room, he would buy them a car. I believe he would have bought them a Cadillac. I always got a laugh out of these people who called in and thought they were going to get a new car by requesting an Elvis song that they thought said DJ wouldn't have in the control room. John Henry used his own personal record collection on the air and and had every rock and roll record imagined. Kind of like Joe Donovan on WHAS' 840 AM in Louisville, who did overnight for years. When Garth and his first wife Sandy moved to Nashville, they bought a house about a mile from us here on "the wrong side" of Nashville, away from the other famous people. We'd see Garth driving by in his pickup truck, and eventually a few fans would stop us and ask how to find Garth's house. After his breakup and "retirement" from performing, he lived mostly in Oklahoma while his daughters grew up. He never sold the house near us and, in fact, bought up much of the semi-rural land around it. He and his wife Trisha (Yearwood) recently decided to move back to the area, and again settled here in the northern 'burbs. My wife became addicted to Zumba in 2011, and came home from her Zumba class last Monday night, announcing that one "Trisha Brooks" had joined her Zumba class. A somewhat different form of "dancing with the stars." I couldn't be happier than to report that Glen Campbell's incredibly moving song "I'm Not Gonna Miss You" has been nominated for an Academy Award. For whatever reason this film never opened here in Chicago so I still haven't seen it ... I guess we'll have to wait for it to turn up on cable or dvd ... kinda like the Boyce and Hart documentary I've been waiting to see that is nowhere to be found. To any of the "powers that be" out there ... PLEASE send us "screeners" and we will help you to get the word out!!! Filmmaker Neil Norman will be interviewed this Saturday early morning on KXLU-FM (88.9) from 3:30 - 4:30 am on deejay Rev. Dan's Music For Nimrods radio program late Friday night / early Saturday morning. GNP Crescendo Records label owner Norman will be discussing the recent label CD reissues of the Seeds as well as his new music documentary Pushin' Too Hard on the seminal Hollywood band. Last week Barry McGuire and P.F. Sloan reunited at a club called The Coffee Gallery in Altadena, California, and performed their #1 Hit "Eve Of Destruction" on the 50th anniversary of its release. Next week on January 23rd DOWNTOWN will celebrate the 50th Anniversary of hitting the No 1 spot on the Billboard chart. Congratulations, Tony, on this special anniversary. After a successful career in Europe for years, Petula Clark finally won over the American audience with this '60's classic. She'd go on to hit The US Top 50 fifteen more times between 1965 and 1968, including seven Top 10's: "I Know A Place" (#2, 1965); "My Love" (#1, 1966); "A Sign Of The Times" (#9, 1966); "I Couldn't Live Without Your Love" (#8, 1966); "This Is My Song" (#3, 1967); "Don't Sleep In The Subway" (#5, 1967) and "Kiss Me Goodbye" (#10, 1968). Thanks for posting the Elvis, Roy and Colonel Parker autograph. I'm working on the 50th anniversary album of "The Arrows" ... not sure how to release it yet (looking for a label or I'll just download it on CDBaby, etc.). Joel Whitburn is letting his "Packer Pride" show with this VERY special offer for a limited time only. As the road to Super Bowl XLIX continues, we're letting our Packer Pride show through by saving you some GREEN on our GOLD seller, Top Pop Singles 1955-2012, now at $20 OFF (reg. $79.95, now $59.95) plus a FREE Top 10 Pop Hits 1955-2011 (reg. $17.95)! 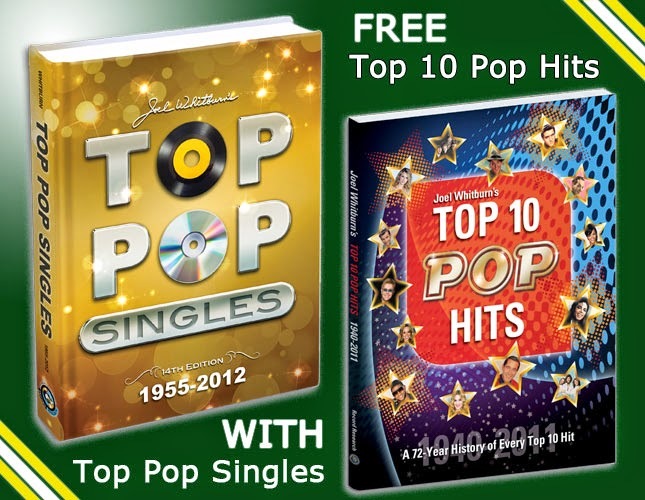 A FREE Top 10 Pop Hits 1955-2011 book will be included with every Top Pop Singles 1955-2012 print book ordered now through 1/19/15, 11:59 p.m. CST. Inclusion of free book will not show up on your online order but will be included in shipment. This offer does not apply to prior orders. Happy New Year to you, out there in Chicago. I'm out here in Davis, CA ... I know at least one other Davisite, Jeff March, who gets your updates. I saw the piece on lyric changes, and I think one of the top ones is "My Boomerang Won't Come Back". It was the first 45 I bought, around 1962. It has the words "Practiced 'till I was blue in the face". In the mid-90's I bought a juke box,and ordered some new 45s, including My Boomerang. The original version has "practiced 'till I was Black in the face" (like the aborigines that the song is based on). The change to "blue" is probably an obvious nod to the emerging civil rights struggles of that time. The original also is longer and has a plane crash ending (the boomerang hit the plane, causing deaths). 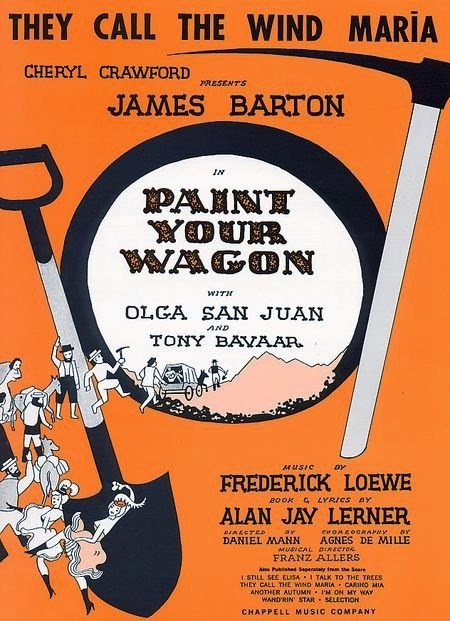 The shorter version, which was played in the states, just ends with the kid throwing the boomerang and it "won't come back". Both versions were pressed onto 45s. And, as for the R&R Hall of Fame, the Buckinghams should be in there, as they were the first to lay the "horn based" groundwork for Chicago, etc ... as you know. Jeff's a great guy ... we're big fans of his work. ("Echoes of the '60's and "Where Have All The Pop Stars Gone".) Word is he and Marti Smiley Childs are already compiling the next edition of this excellent series. Today's column hit home for me when you mentioned your version of the Rock & Roll Hall of Fame which you referred to as “THE GOLDEN AGE OF ROCK AND ROLL". Flash back to 1974 and the MOTT THE HOOPLE song by the same name. Well worth a listen. Great song totally forgotten by radio. So sad. 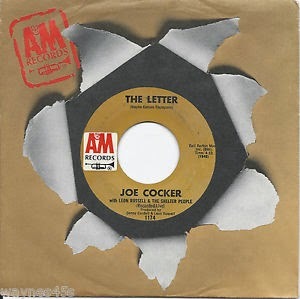 On your list of Joe Cocker hits, you showed "The Letter" as a live recording. It actually is a studio recording. It is very similar to his live version from Mad Dogs and Englishman, which was his hit album at that time but you can hear a number of differences including the sax solo and no crowd. Back in 1970 many stations played the live album version but AM stations WLS and WCFL played the hit 45 version. In more recent times, Classic Rock stations played the live version forever, but Bob Stroud did switch to the 45 hit version when the song was finally mixed to stereo for the first time for the deluxe version of Mad Dogs and Englishman live album a number of years back. On your Joe Cocker list you should put "live" for his follow-up single Cry Me A River. Came across this by chance on Detroit's PBS. Interestingly, it's not listed on the PBS Homepage. Seek it out. It's wonderful. EYE ON THE 60s is an authentic piece of American History … an intimate portrait of former LIFE photographer Rowland Scherman and how his photographic eye captured the essence of America's most remarkable decade. Experience candid recollections with seldom seen moments of major celebrities, politicians, and breathtaking events. Follow the path of a self-driven man who became the first Peace Corps photographer, an insider to the Kennedy and Shriver families, and who created an astounding record of The March On Washington. Travel with Scherman through time to witness the young Bob Dylan, The Beatles, Arthur Ashe, Barbara Walters, Joni Mitchell, and Judy Collins. From Washington, D.C. to the site of the 1969 Woodstock Festival-- and to the healing vistas of Cape Cod, EYE ON THE 60s is the story of a man that despite technological change and the great passage of time, moves in a space of peace, humor, and hope… while remaining forever driven by the need to create. Legendary Chicagoland Newscaster Bill Kurtis is also launching a new program called "Through The Decades", a daily look back over the years that will utilize archive footage from the CBS News and Entertainment Tonight archives. This one hour daily program will launch in May on sixteen CBS-owned stations across the country and spotlight "a different year or day, trend or event through the unique lens of 'Decades'." Billed as "The Ultimate TV Time Capsule", the official press release says "From moon shots to galvanizing events to pop culture snapshots in time, 'Through The Decades' will unlock our shared history, exploring the decades of the 1950's through the 1990's, reimagined and relived each day." Andy Kim's remake of "Shoot 'em Up, Baby" is quite nice ... well worth a listen. It's on his new album. I heard on a network news that it's been quite cold there in Chicago lately with temperatures no higher than 0 degrees on some days. Again, what FH does to me is it reminds me of a song or songs I haven't heard in a long time, likewise, things I see and hear during the day. When I heard the news about your 0 degree temperatures, for some reason, it reminded me of two songs. The first is Johnny Horton's 1959 song, WHEN IT'S SPRINGTIME IN ALASKA (IT'S 40 BELOW), so it could be worse, and the second is country singer Merle Kilgore's 1961 tune 42 IN CHICAGO, though I believe the 42 in question is above 0 degree and not below. Good luck and stay warm. We went through a MAJOR cold spell ... actual temperatures of -6 to -11 ... with windchills down to -35!!! One day, they closed all the schools 15 hours in advance of classes just to be safe. Then the next day we got about six inches of snow and the schools were open! (Go figure!) And, believe it or not, our furnace went out the week before ... thankfully, it's fixed and running now!!! You also stated in today's FH, second paragraph from the end, how in the world could you remember certain items from the songs out years ago, but couldn't remember key events from the week before. Well, I was the same way, so to speak. Through the years I could tell you key events or things about certain songs or groups or artists from years ago, but yet had a tough time remembering certain things from days or weeks gone by. This kind of proves that this rock and roll music is definitely embedded in our minds. Here's another one of those unsung heroes of rock and roll ... you already know most of his work ... but may not know him by name! Nashville, TN - With the recent passing of Bobby Keys, the last of the legendary rock sax players still remains - Phil Kenzie! Phil has the great distinction of playing sax on The Beatles legendary 'Let It Be' album! Along with The Beatles, Phil's impressive resume includes recording sessions and tours with such iconic music groups and artists as John Lennon, George Harrison, Paul McCartney, Black Sabbath, David Bowie, Rod Stewart, The Eagles and many others. It's easy to be familiar with Phil Kenzie's superb sax work. Just recall the soaring solos on Al Stewart's “Year of the Cat” or “Time Passages”, still enjoying favored airplay to this day ... or the punchy brass intro to “Jet” by Paul McCartney ... or the inspired solo on “The Long Run” from “The Eagles Live” album. In fact, this gifted sax player / arranger has lent his masterful touch to hits by everyone from Rod Stewart to Jackson Browne, Stevie Nicks and Rosanne Cash to David Bowie, and in the process amassed some nineteen gold and platinum albums! Phil also holds the world record for the highest note ever played on Alto Sax on a solo on a top ten hit record (entry note on the first solo on “Time Passages” by Al Stewart). A documentary of Phil's incredible musical journey is in progress and is 99% finished. With 120 minutes in length, it is produced by Harry Jarvis an Independent video producer from Nashville TN. Phil relates, “I'm originally from the Liverpool area in England and in my first band, The Pressmen, I played many of the clubs made legendary by The Beatles, even occasionally sharing billing with the 'Fab Four', including The Cavern and Hamburg's famous Star Club. So it was totally appropriate that I should be asked later to play on the most classic 'swan song' of the century, 'Let It Be'. This connection continued with my work on recordings for Apple Records, most notably John and Yoko's 'Plastic Ono Band' at Lennon's home in Ascot and all of the horn section work and solos on George Harrison’s 'All Things Must Pass' and playing in the massive sax section on 'Jet' for Paul McCartney and Wings. Through these sessions, I also worked with such notable stars as Eric Clapton, Steven Stills, Peter Frampton, Delaney & Bonnie, Leon Russell, Doris Troy and Billy Preston. Now, much to the excitement of his fans worldwide, Phil is releasing a CD titled 'A Night With The Cat'. The album, recorded between 1998 and 2008, has never been released before and is an instrumental depiction of the lyrics / story of “The Year Of The Cat” hit single by Al Stewart, in which Phil plays the world acclaimed hit saxophone solo. Titles on Phil's new CD reflect the lyrics of the song. Phil is backed on 'A Night With The Cat' by Peter White “king of the soft jazz charts”and legendary session players Bob Babbitt and Larry Knechtal. In support of his new CD release, plans for Phil's S.O.S.S (Save Our Sax Solo) tour is currently in the works. The show will premier at Jazziz Nightlife on Jan 15th, 2015 in Boca Raton, Florida. Considered one of the greatest rock 'n; roll sax players of all time, Phil Kenzie has worked with The Eagles, Rod Stewart, Graham Nash, David Crosby, Rodney Crowell, Roseanne Cash, Brian Wilson, Vince Gill, Stevie Nicks, Jackson Browne, Karla Bonoff, America, Boy George, Carly Simon, Randy Meisner, Steven Stills, Poco, The Pointer Sisters, Kenny Loggins, Tom Petty, Ronnie Spector, David Lyndley Eric Carmen and Debbie Gibson etc. At his latest sell out concert appearance with Al Stewart at The Royal Albert Hall on October 15, 2013, Phil received a standing ovation from a more than 6000 strong audience. Also, The Eagles have recently posted two songs on their official website featuring sax solos by Phil! Forgotten Hits reader Eileen mentioned the song "They Call The Wind Maria" but spelled it as "Mariah". Yikes! That Carey singer's name has muddied the waters and probably forever. I know I can't change anything but here's the sheet music with the sign over the I indicating how it should be pronounced. You might label this as a pet peeve. The first 45 I bought was an instrumental called "Scratchy" by Travis Wammack. 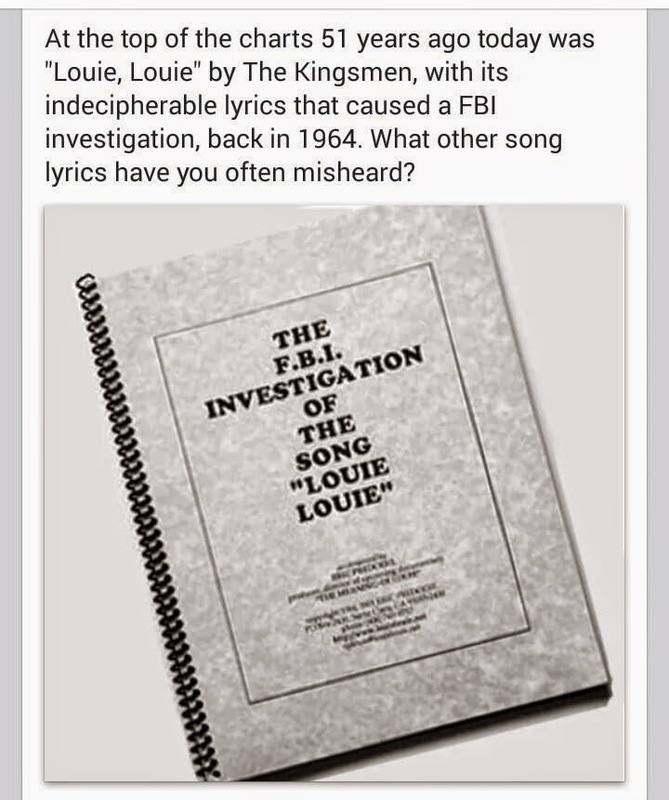 I first heard it on a jukebox in a little hamburger place in Charlotte around 1964. I wore that record out! The first LP I bought was Telstar by the Ventures in 1965. I earned the money to buy that album by painting the outside of our house. Since those days, I now have more than 10,000 albums, more than 2000 45's, and I don't know how many collectable 8-tracks (many sealed), cassettes, and even CDs. I have many 78's and also some Edison 1/4" thick discs. Just for kicks and giggles, I just had to have an Edison cylinder (with cardboard tube) and a 16" V disc. I think I have all formats and I have came to the conclusion that ( to me ), the BEST sound comes from a 45 that is in good condition! It has been a long time since I have written and I am here to say that even though you don't hear from me regarding Forgotten Hits, I am here and I appreciate all that you do. I am nobody special, just a reader who wants you to know that your newsletter means so very much to me. I love the oldies and hearing about the songs and the groups who made my world, as I was growing up, a better place to be. Love, Love, Love ... Forgotten Hits. Check Out This Canadian Chart!